Buying muni bond mutual fund can provide instant diversification for investor assets. Typically, these municipal bond mutual funds are less risky too. 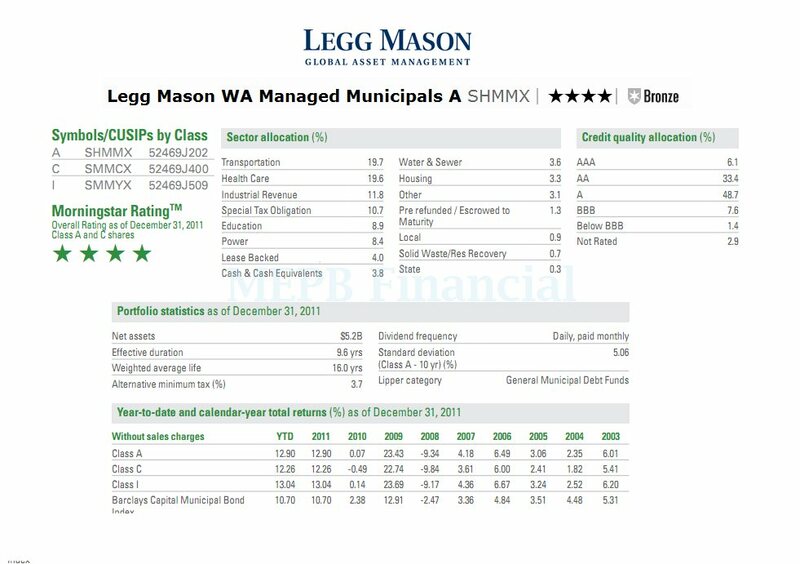 The following top ranked national municipal bond mutual funds of 2012 are: Legg Mason WA Managed Municipals A, First Investors Tax-Exempt II A, Lord Abbett Intermediate Tax Free A, etc. In general, investors like tax free income. We can find tax free benefits through Roth IRAs. After many of us max out our Roth contribution and employer 401k or traditional IRA accounts, we can start choosing municipal bonds to invest to get the same benefit. One of the best feature of this muni bond is the income from the bond is exempted from federal income tax. One would ask how I can invest in municipal bonds. You can choose to buy individual municipal bonds, muni bond mutual funds, municipal bond closed end funds, or muni bond ETF. This article will focus on best muni bond mutual funds of 2012. These best performing funds are rated based on its 5 years performance. I have included a short review of these funds for your interest. The data include fund performance, fund manager, dividend yield, top holding, top sector, fund ranking, etc. The investment objective of this Legg Mason Western Asset Managed Municipals fund is to maximize current tax free interest income with prudent investment management and the capital preservation. This interest income is excluded from gross income for regular federal income tax purposes. This SHMMX fund uses most of its assets to buy intermediate-term and long-term municipal securities. The Morningstar analysts have rated this mutual fund with Bronze rating. It also has 4-stars rating from Morningstar. The weighted average maturity of this fund is 15.03 years and the effective duration is 9.12 years. It has total net assets of $5.34 billion. The dividend yield is 4.30%. Stephen A. Walsh is the current fund manager of this Legg Manson fund. 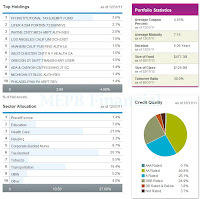 The top sectors of this municipal bond mutual fund as of February 2012 are Transportation (19.62%), Health Care (19.48%) and Industrial Revenue (11.84%). The 10-year annualized return is 5.49%. The First Investors Tax-Exempt II fund invests all of its assets in high quality municipal securities that pay interest that is exempt from federal income tax, including the AMT. Typically, the bonds purchased by the fund have maturities of 15 years or more at the time of purchase. Note: High quality bonds means investment grade municipal bonds. This National Intermediate Muni bond mutual fund has a five year annualized return of 6.30%. The fund’s manager is Clark D. Wagner since 1991. The fund has an expense ratio of 1.01% compared to a category average of 0.83%. This fund is rated with 3 stars rating by Morningstar. Investor can invest with $1,000 initial funding in brokerage account and $500 in IRA account. The Lord Abbett Intermediate Tax Free A fund seeks the maximum amount of interest income exempt from federal income tax as is consistent with reasonable risk. It may invest <20% of its net assets in municipal bonds that pay interest subject to the federal alternative minimum tax (AMT). Morningstar gave this muni bond mutual fund a 4-star rating. The 12-month dividend yield is 3.49% and is distributed on monthly basis. The most recent distribution was in January 31, 2012 ($0.03). The YTD return of this fund is 1.95%. The annual expense ratio of this LISAX fund is 0.64%. This fund can be purchased from 68 brokerages such as Merrill Lynch, Edward Jones, JP Morgan, etc. The State Farm Tax Advantaged Bond fund typically utilizes majority of its assets (>80%) to buy investment grade municipal bonds within the highest four rating categories of Moody’s or S&P. The majority of the fund’s investments are in bonds with maturities >5 years. This Muni National Long fund was first introduced to public in May 2006. The lead manager is Duncan Funk. The fund has annual expense ratio of 0.68%. The front end sales load of this TANAX fund is 3%. Investor can start investing in this muni bond fund with as low as $250 for either brokerage or IRA account. Since its inception, the fund has always contributed to positive return. The fund has 5-year annualized return of 6.07%. The annual holdings turnover rate is 4%. 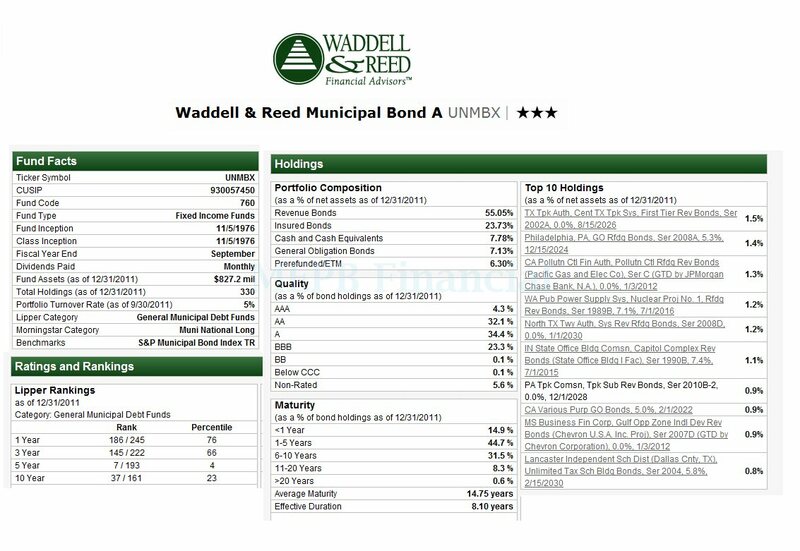 The investment aim of this Waddell & Reed Municipal Bond fund is to provide the level of current tax free income consistent with capital preservation. This UNMBX fund invests >80% of net assets in tax-exempt investment grade municipal bonds with any maturity. This top muni bond fund may invest considerably in municipal bonds payable from revenues derived from similar projects, such as those in the health care sector. Bryan J. Bailey is the current lead manager of this fund. He is also the Senior Vice President of Waddell & Reed Investment Management. The fund has 3.84% dividend yield that is distributed on monthly basis. The benchmark of this Muni National Long fund is S&P Municipal Bond Index TR. The average maturity of this mutual fund is 14.75 years and the effective duration is 8.1 years. The turnover rate is 5% while the average in the category is 23.24%. This fund has 3-stars rating from Morningstar. This Virtus Tax-Exempt Bond fund is rated with 4-stars rating by Morningstar. It has annual expense ratio of 0.85%. Investor can open a brokerage account in this fund with $2.500. The 12b1 fee is 0.25%. The top states in the portfolio are Illinois (12.62%), New York (12.11%), California (8.79%), Colorado (7.05%) and Puerto Rico (7.03%). 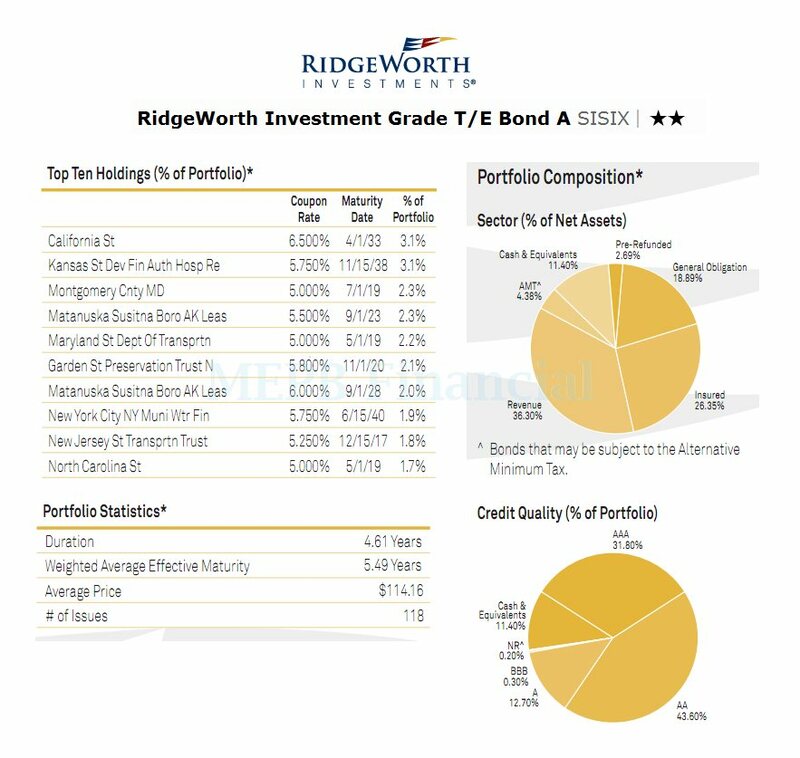 The RidgeWorth Investment Grade Tax-Exempt Bond fund invests >80% of its net assets in investment grade tax-exempt obligations, such as municipal securities. The fund may invest in any U.S. state, territory or possession municipal bond. The fund may invest <20% of its assets in securities subject to the U.S. federal alternative minimum tax. It may also invest in some taxable bonds. 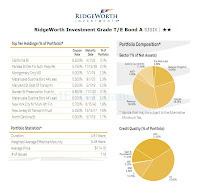 This Ridgeworth fund has dividend yield of 2.08%. The minimum initial investment for brokerage or IRA account is $2.000. Ronald H. Schwartz has been the fund manager since its inception in June 1992. The fund has 3-year annualized return of 6.82%. This top performer fund has recorded 17 years with positive return and 2 years with negative return. The YTD return is 9.28%. The other class is Institutional Shares (STTBX). The Nuveen All-American Municipal Bond fund invests majority of net assets (>80%) in investment grade municipal bonds that pay interest that is exempt from regular federal personal income tax. This muni bond fund may invest <20% of net assets in high yield municipal bonds. The expense ratio of this fund is 0.78%. This investment fund has total net assets of $908.08 million. This fund was given 4-stars rating by Morningstar. The 3-year beta is 1.33. 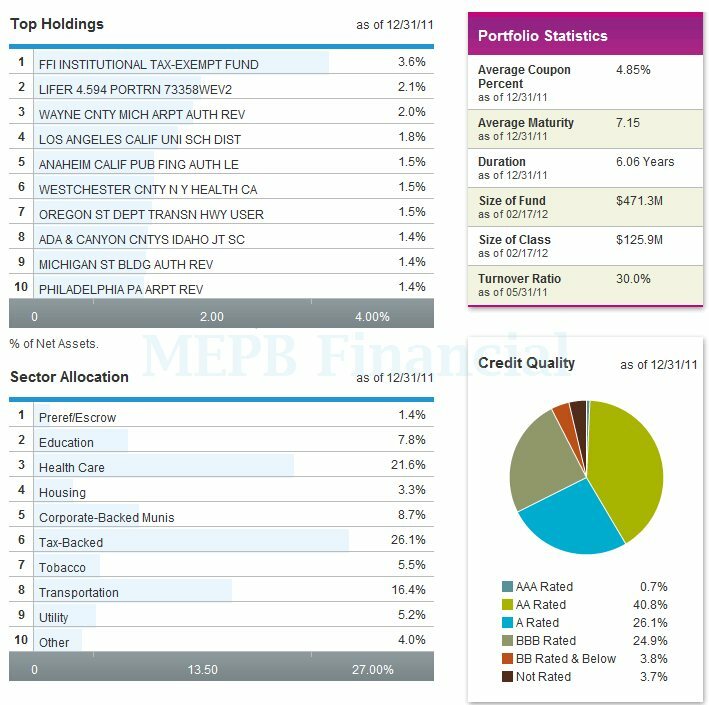 The top sectors of this fund as of December 2011 are Tax Obligation/ Limited (22.6%), Health Care (19.4%) and Education and Civic Organizations (9.9%). You may also interested in my previous article, Top Performing Tax Free Muni Bond Funds. The investment objective of RidgeWorth High Grade Municipal Bond fund is to achieve current income exempt from regular federal income tax other than the alternative minimum tax while preserving capital. The fund’s lead manager is Ronald H. Schwartz since the inception in 1994. The annual expense ratio is 0.80%. The dividend yield is 3.02%. Investor can purchase this fund from 40 brokerages such as E Trade Financial, JP Morgan, Raymond James, Schwab Retail, etc. The front-end sales load fee is 4.75%. The BlackRock Intermediate Municipal Investor fund invests mainly in a portfolio of investment grade municipal bonds. The fund may invest in either fixed rate or variable rate bonds. Its weighted average maturity normally is between 3-10 years. Since 2006, this best muni bond fund has returned in 4 years of positive return. The only year it returned negatively was in 2008 (-4.32%). The YTD return of this fund is 2.92%. The dividend yield is 3.31%. The current lead manager is Timothy T. Browse. The average duration is 6.06 years and the average maturity is 7.15 years. Morningstar gave this Wells Fargo Advantage Municipal Bond fund a 5-star return rating based on its performance in the market since 25 years ago. The fund has 3.27% YTD return. The 3-year beta risk is 1.00%. This national muni bond fund’s total net assets are $2.65 billion. The benchmarks of this SXFIX fund are Lipper General Municipal Debt Funds Average and Barclays Capital Municipal Bond Index. Lyle J. Fitterer and Robert J. Miller are the fund managers. This Invesco Tax-Free Intermediate fund has annual expense ratio of 0.60% compared to the average of 0.83% in Muni National Interm category. The total net assets of this fund are $1.44 billion. The annual holdings turnover rate as of February 13, 2012 is 18.00%. This top muni bond fund has 3-year annualized return of 6.79%. As of December 2011, this fund has a total of 810 holdings. The weighted average effective maturity is 6.97 years and the effective duration is 4.53 years.